This uniquely comprehensive study explores all aspects of the English business community as it developed between 1590 and 1720. 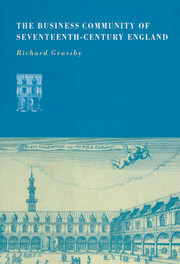 Drawing largely on material in private papers, Richard Grassby describes and explains the structure of business in a pre-industrial economy and examines the way in which social values, demographic factors, the family, state and religion distributed talent, trained and motivated businessmen and determined their life style. His book will appeal to all who wish to understand the dynamics of pre-industrial growth and the interaction between business and society. Introduction: Questions and sources; 1. The status of business; 2. Obstacles to entry; 3. Funding and risk; 4. Necessity and choice; 5. The pattern of recruitment; 6. Skills and motivation; 7. Politics and government; 8. The measure of success; 9. Religion and ethics; 10. Family structure; 11. Consumption and leisure; 12. A symbiotic culture; Conclusion. Private enterprise in a pre-industrial economy.